Some tiny insects are currently causing a great deal of concern, especially among pregnant women. The yellow-fever and tiger mosquitoes can pass on the zika virus and are suspected of causing microcephaly, a developmental disorder that affects unborn babies. The results of the zika virus infection are miscarriages and babies born with small heads, who are likely to be severely mentally handicapped. According to the World Health Organization (WHO), 33 countries had already been affected by the spread of this dangerous virus by February of this year, with Brazil and Colombia being the worst affected countries. Health experts have been studying female anopheles mosquitoes for some time. These transfer the malaria pathogens and are just as dangerous to humans. A child dies every 30 seconds from the tropical disease known as swamp fever or malaria. But malaria is also responsible for a high number of deaths among adults. This disease is prevalent in 106 countries globally and is a threat to more than half of the world’s population. The WHO recommends that all the public health authorities worldwide use insect-proof nets having long-lasting insecticidal effects (LLINs) to reduce the incidence of malaria quickly and effectively. These fine-meshed textiles are the best method of prevention and are easy to use, effective and cheap. KARL MAYER’s warp-knitting machines can be used to efficiently produce these nets, which provide a high level of protection. 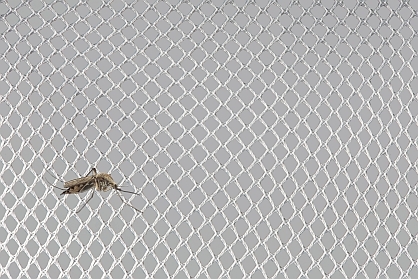 In addition to the mechanical protection provided by the textile construction, mosquito nets also provide chemical protection by treating them with a contact insecticide. The most frequently used pyrethroids are applied to the nets by a standard impregnation process or by long lasting impregnation (LLI). Products that have been treated by the standard impregnation process lose their effectiveness after six months and after every wash, and the insecticide has to be re-applied regularly. LLI mosquito nets, on the other hand, can be used for more than three years and washed up to twenty times. 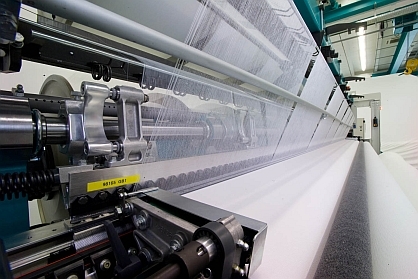 Warp-knitted mosquito nets are mainly produced on two-bar tricot machines, such as the TM 2 and HKS 2-M. KARL MAYER’s machines offer the best in terms of quality and productivity. The machines operate in gauges E 28 or E 32 when working polyester filament yarns. If polyethylene (HDPE) monofilament yarns are used, they are worked usually in gauge E 14, but slight variations above or below this are also feasible. The two types of yarns have different constructions and properties and also differ as to how they are used in conjunction with the insecticide. Whilst the warp-knitted polyester textile is impregnated with the chemical at the finishing stage, the agent is already present in the HDPE at the granulate stage. Despite their high operating speeds, KARL MAYER’s tricot machines do not compromise on quality. The machines offer maximum precision and thus meet stringent requirements in terms of dimensional stability and uniformity of the mesh openings, tear resistance and weight per unit area. This attention to detail is definitely worth it, since any variations in the specified parameters can cost lives. In addition to tricot machines, raschel machines having three guide bars can also be used to produce certain products.